M. is a 48 year old MAN with Stage 4 breast cancer. (1% of all breast cancers are in men. It is often found at later stages since men are not routinely screened.) M. is a married father of 9 children, (1 soldier, 1 married, the rest live at home,) who can no longer work due to the side effects of treatment for cancer that has spread to his lungs and bones. His wife works in eldercare, but she is overwhelmed with caring for her ill husband and young children. The family is now deeply in debt and is in crisis. The Lemonade Fund awarded them a grant to alleviate some of their financial pressure during this difficult time. V., 37, has been in and out of psychiatric hospitals since she was a young adult, her mental health issues possibly compounded by sexual abuse she endured as a child. V. has had addiction problems as well (drugs and alcohol.) She was trying to get her life back on track (she recently began studying graphic arts and had coaching which was really helping her.) And then she was diagnosed with breast cancer. The diagnosis caused a suicide attempt and V. is in a very bad place. Her partner, with whom she lives, is recovering from back surgery and is unable to work. They are beginning to take on debt and need help. The Lemonade Fund grant will help sustain them until they can get back on their feet. 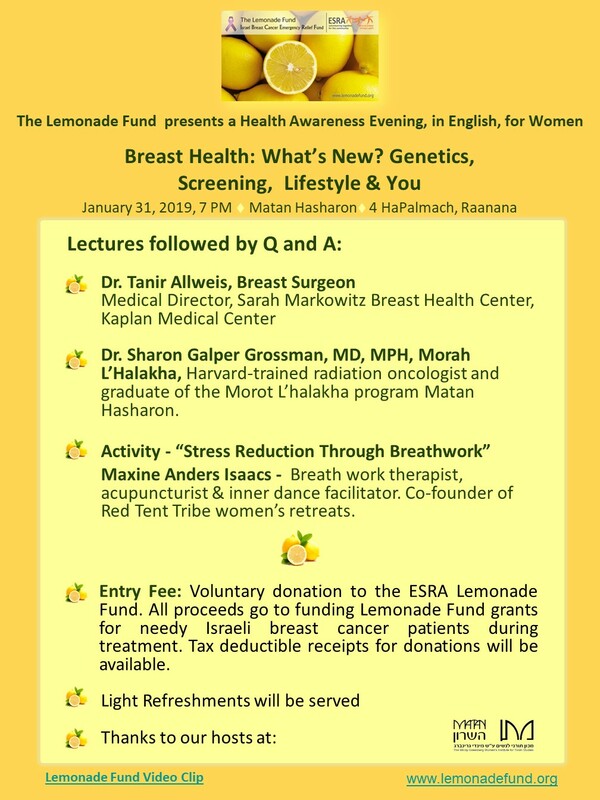 The Lemonade Fund is the only Breast Cancer Emergency Relief Fund in Israel, helping all Israeli citizens.